Mario Galaxy is to this day, still considered one of the best games on the Nintendo Wii, and has most recently the BAFTA game of the year award (2009) . During it’s coverage over the years it has had two different versions shown to audiences during the beta stages. The initial beta which was demoed on playable booths at the GDC, E3 and etc, mainly seen in 2006. And the Pre-Release Beta, a series of images and videos used to tease the audience, closer to the final form of the game but with little suttle differences. The Initial beta was used as the first playable demo to audiences, it features many placeholders such as mario 64 soundbits as mario’s voice and various textures and gameplay elements. The HUD was also similar to that of Super Mario 64, using a 8 point health system rather than the tradional 3 point which became the final design, however this along with many other little changes were most likely put in to allow easier gameplay to the audience at the time. The limit to star bits (Called Star shards during the game, possible reference to the Kirby series.) was capped to 100 with a meter showing so, this was later scrapped to a 999 limit used in the final build. Various gameplay mechanics were changed, such as boss monsters seen in the beta were easier to kill than those in the final. This may of been to help the audience at the events finish the level faster without being hit by the time limit. Mario was allowed to spin non stop, without the Luma needing to recharge, this may of been to help preserve the inital storyline as well to weaken the difficulty. Different characters who were vital to Mario’s progress had a speech bubble above their head to signal their importance, this may of been used to speed up the process of learning how to play while in game at the time. Aside from little changes there were more noticable and intricate ones, such as the Star World galaxy, which used different music and was a compilation of various galaxies together. It was most noticable as the early version of the Good Egg Galaxy. The fight with Megaleg also didn’t feature the scene with Baby Bowser, although it was possible he wasn’t written into the game at the time it could of been to preserve storyline and plot details. 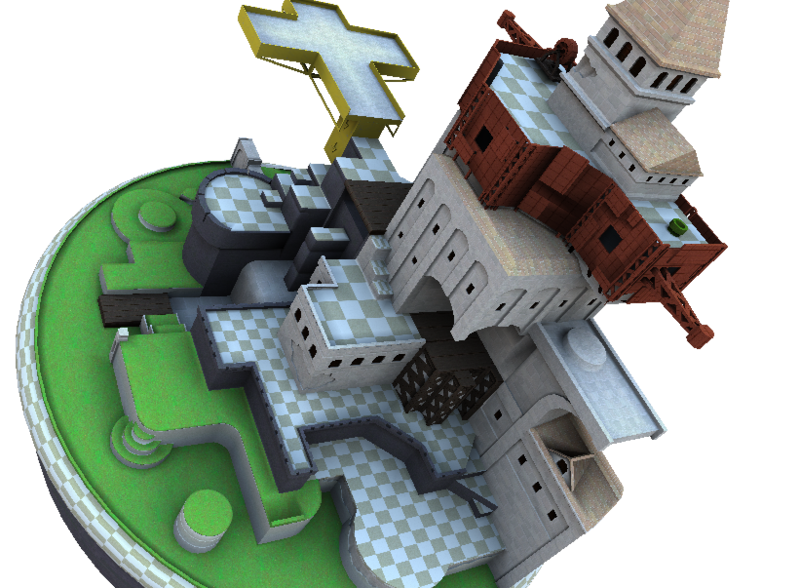 A detailed model of the home planet from the Star World galaxy was found in the games code, however it wasn’t shown as anything other than a model. It is currently unknown is it is possible to play in this level via hack. There are also a number of odd items hidden in the games code, such as materials and models for unused items, such as a inflatble mushroom, various monsters and a odd blob like creature which may of served as a boss monster. The level itself: The level shown was a combination of various galaxys like the Good Egg and the space junk. If you notice, the planet with the house is like the one in the Good Egg, but totally different. Here, the textures used on the land were different, more simple and not as complex like they are now. This is most likely due to the fact that Nintendo wanted a clean cut version out. Instead of the cardboard like textures that made it into the game you can see clear simple green on brown, Good and colorful. Gameplay: Instead of using the cursor to pickup starbits, you had to hover over then and press B, this feature was taken out, also you can see that you could collect only 100 starbits in each level. This was taken out and changed to 999. When mario was shaken to attack an enemy, the Luma never popped in and out. Mario could spin nonstop, I believe that was either to keep the story hidden or wasn’t thought of yet. Thanks to Mr. Game for the help with these images! In the Super Mario Galaxy Cellector’s Edition Prima Official Guide at the last pages is possible to find ORIGINAL CONCEPT ART made by the SMG developing team. A high-quality planet that was ultimately scrapped, much to the dismay of the development team. The two pipes on the planet are not warps but instead have the fully modeled tube interior, with the second pipe leading from the top of the tallest roof to the spherical underside of the planet. The yellow structure bears the same electric symbol as the ChargeSpot model. It, too, has concept art in the Prima guide. As can be seen by the concept art, it went through several incarnations, with the last two being left in the game files. The version seen in the concept art depicts features such as a snowy area and a construction site. it’s also interesting to note that this same image also shows BossCrab, Planet Disk, and three copies of the Star Planet. It also shows some generic spherical planets and the space ship planet used in Space Junk Galaxy. A drawing of Mario on a beach at the sunset. For strange reasons, that beach is pretty, similar to the Hammerhead Beach from Banjo-Kazooie, a level that is strongly releated to Stop’N’Swop. In the Game’s Disc there are also 3D models that indicates the presence of the Topmaniacs in Melty Molten. There’s something that Luma holds in her hand, even if there isn’t any Luma holding the wand in the final game. But there’s an unused beta 3D model, named “MagicalWand”; it’s possible that it isn’t a precursor to the Kamella’s Star Wand, but it’s a beta Luma’s wand. The Pre Release Beta was very similar to the final build of the game with just some small changes in things like level names, and mission names. Some Pre-Release beta videos also showed some missing elements such as small level details. A good example can be seen in the video below. The over all picture is that alot of the beta was used as demonstration, various galaxies were shoved into each other as experimentation, like the Topmaniac fight in Melty Molten Galaxy. Various galaxies had different names like the Honeybee galaxy to Honeyhive, Gale galaxy to Gusty Garden. Also, various features switced places. Thanks to Mariowiki ke know that the Beta version of Super Mario Galaxy showed conjecturaly named species called Cosmic Toads, a kind of Toad that lives in outer space. They were supposed to live in Toad Houses in various galaxies. They told Mario how to use Launch Stars or would give him Star Bits. Rabbits were also going to be able to change into Cosmic Toads. The Starshade Brothers from Superstar Saga looked similar to them. Their role was likely replaced by Lumas. Also, according to one of the screenshots, Bowser was originally going to be fought on an arena on a magma planet instead of a glassy planet like in the first 2 battles. There was also going to be a giant green Pokey in the Dusty Dune Galaxy. It probably was replaced by Red Pokeys, and it resembled a Poison Pokey. Mario would also be able to lock onto boulders with the Star Cursor and stun them. Thanks to Lord Deathsaur & SMBMadman for some of these screens! i posted that mario kicking goomba picture! Can the star world be accessed with power saves? You forgot one of the biggest and most obvious differences. The good egg galaxy song sounds really nice slowed down like that. Do you think Luigi was planned to be in the final game? Perhaps not. SMG’s Luigi is more like an altered version of Mario with less traction, better jumps, more star spin buffer, air lose when starspins underwater, and less air when underwater. Super Luigi Galaxy is like Super Mario Galaxy’s Hidden Mansion (a harder version of Luigi’s Mansion on PAL versions). Hope in SMG2 he has a better role than just being kidnapped by Bouldergeist and finding hidden power stars….. Something mor like SM64DS but better……. As I I recall the later betas also allowed the player to to freeze enemies with the pointer. Witch is only possible with the second pointer in the final version. Sadly, I think that that version of the trailer is nowhere to be found @ internet…. Some models that girrtacos found. I searched for them in the iso, opened them up, and recorded them doing some animations. Sorry- I meant to say something about Yoshi, but that doesn’t matter now. ANYWAYS, In one of those videos, that Good Egg Galaxy is a different recording than what’s used in the final game. Contains a boatload of more unused models! I really need to update this page ASAP! Hello! I come from the Super Mario Wiki. By a mistake, some of our images were deleted, and I figured you might have a copy of them, or the original one. Do you know which is the image where Mario is kicking a Goomba and a beta version of Space Junk Galaxy? Currently i cant find that Mario Kicking screen or the Beta Space Junk, but i’m sure that someone else will be able to reupload them! I remember seeing footage on G4 of a Gamecube version of Super Mario Galaxy, circa 2005-2006. However, I am unsure if it really was footage of a Gamecube version that was in development at one point, or if it was actually on Wii right from the start, but G4 made a mistake and listed it as Gamecube instead. Does anyone have this footage to confirm? 1. Whenever I click on the initial beta concept art images, it just shows a red cross-out symbol! Do you know how to fix this? 2. Can I make a video using this information?